Kangaderoo Custom QR Code. : NeoNeonMiner, Yescrypt and P2Pool. "Keep an eye on the nodes"
With the APP NeoNeonMiner you can become a miner in the crypto-currency community. But mining on a mobile device is a magnitude smaller in comparison to mining on a high end PC, GPU or ASICS. To get the most out of NeoNeonMiner mining, best select an algorithm that is labeled CPU only. The Yescrypt algorithm is one of these algorithms. There are some mining pools that support this algorithm (like zpool.ca). The biggest problem with these multi protocol mining pools is that they favor the high end miners, and are therefore not the best choise for the NeoNeonMiner app. With NeoNeonMiner you will run into difficulty thresholds and minimum payment restrictions that require you to mine for a long time before you get rewarded. Most of the multi algorithm mining pools have increased the minimum payout threshold in the last year. An alternative is to mine in a P2Pool network. The difference between a mining site and P2Pool behavior is that distribution of the found coins is done directly when a block is found, this distribution is actually part of the found block, eliminating transaction fees. The restriction of a P2Pool network is that your pay-out will be in the mined currency, where a multi algorithm mining pool might be able to pay in any of their mined currencies, including Bitcoin. 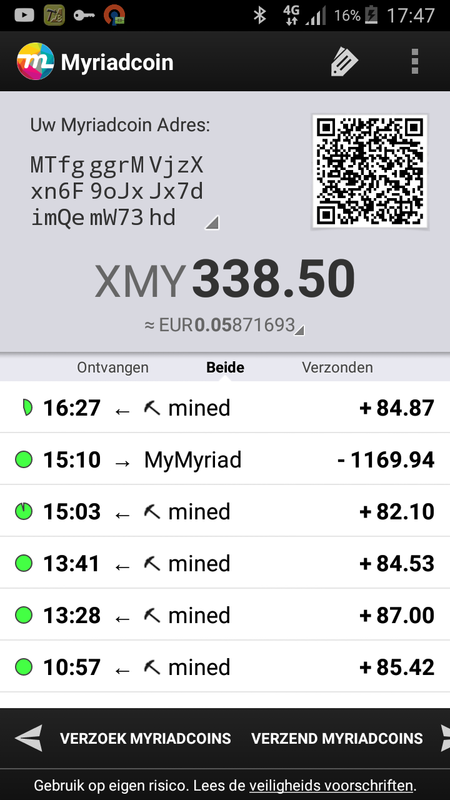 With the selected algorithm being yescrypt, Myriad coin is one of the currency that can be mined. 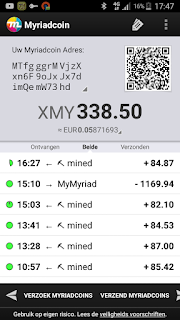 Myriadcoin has a good exchange rate to Bitcoin and is traded on most of the crypto exchanges. For the NeoNeonMiner setup a Myriadcoin address is needed. A quick PlayStore search shows a Myriadcoin wallet for android. 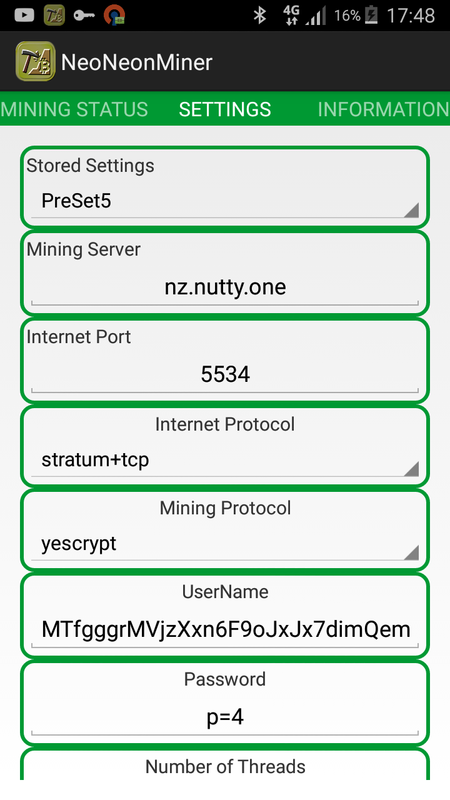 The shown address can be directly copied and pasted on the settings page of the NeoNeonMiner app. The wallet does need to synchronize with the Myriad block chain, this will take some time. Obtain your other setting; the Myraid P2Pool node information. UserName: Your MyriadCoin Address (copied from the wallet). On the same server the status of the active miners can also be found. The MyriadCoin P2Pool network is not one of the largest, consider to become a Myriad P2Pool node. Hint: specially with slow miners, the interval between found blocks could be very small. You can 'set' your own share difficulty by adding this to your username (coin address). the syntax to use is: "MiriadCoinAddress/0". The "/0" lets you mine using the lowest accepted share difficulty of the P2Pool. can you add Hodl algo. and make use affinity/cpumask on miner.